What a fascinating conversation with periodontist, Dr. Al Danenberg. We discuss the gut mouth connection, how improper flossing could lead to receding gum, new testing showing that mouth tissue is a window into your mitochondrial health and how mouthwashes could lead to high blood pressure. Inflammation in the gut leads to inflammation in the mouth. Two systematic reviews have shown that probiotics can be an effective treatment for periodontal disease. Both found oral probiotics had a positive impact on periodontal disease. When a person starts to have gum disease, generally one of the main bacterium that gets over-produced is P. gingivalis (a gram negative bacteria). It has an outer coating that is loaded with LPS, which is extremely inflammatory and creates an immune response resulting in breakdown of the gum and bone around the teeth. Any studies to support use of probiotics and K2 for periodontal disease? Gingivitis – inflammation and infection of the gum tissue that has not penetrated the jaw bone. Can be reversed. Why does gingivitis progress to periodontitis in some patients and not others? What makes someone more susceptible to receding gums? If you were born without this thin layer of bone (pretty common) then you are more susceptible, especially when you brush hard. If you have healthy gums and do not have pain, you don’t have to do anything. Other battery operated toothbrushes like Quip are fine so long as they are soft and you brush lightly while using it. Clinical efficacy of probiotics as an adjunctive therapy to non-surgical periodontal treatment of chronic periodontitis: a systematic review and meta-analysis. The role of probiotic bacteria in managing periodontal disease: a systematic review. Dr. Michael Ruscio: Hey, everyone. Welcome to Dr. Ruscio Radio. This is Dr. Ruscio. Today, I’m here with Dr. Al Danenberg. We’ve been trying to connect for awhile. And we finally were able to get connected here. And he is doing some great work in, I guess you could say, the gut-mouth and mouth-gut connection. And I’m excited to pick his brain. So, Al, welcome to the show today. DrAD: Thank you, Michael. It’s a pleasure to be here. And it is great to connect on podcasts. Obviously, we met in Paleo. But in a podcast, that’s fantastic. DrMR: We’ve been corresponding via Facebook messages and email. And we finally met for the first time at the speaker dinner at Paleo f(x). And trying to have a conversation there is like trying to have a conversation with a child who has ADHD and is also on speed. DrMR: And the amount of people buzzing back and forth, you can’t get more than 30 seconds into a thought without being interrupted. But we had a chance to talk a little bit. And I was definitely curious to dig more deeply into the gut-mouth connection. We’ve discussed this on the podcast before, if the audience remembers back. The first person we had on was Dr. Mark Burhenne, who authored the book, I believe entitled The Sleep Paradox. And he really, I think, opened our eyes to the connection to your mouth as an indicator of, amongst other things, your sleep health. He really did a good job of helping us understand how something like receding gum may be an indicator that you have sleep apnea or oral airway impairment that’s throwing off the pH in your mouth and causing degeneration of the oral cavity. So that was interesting. Later, we followed that with Dr. Steven Lin who gave us a good iteration, I guess you could say, of the Weston A. Price philosophy of the importance of the gut and nutrition’s impact on the mouth. And I think we’re going to dive into both of those. But Dr. Danenberg has some interesting information regarding the mitochondria connection of oral health and will also touch on the heart disease connection. So there’s a lot for us to cover here. Before we start parsing through these topics, Al, do you want to tell people just in brief about your background and how you, I’m assuming, deviated from a standard dentistry practice into the more holistic practice that you’re in now. DrAD: Sure. Absolutely. So hopefully, if I go on with diarrhea of the mouth, you’ll just shut me up. DrAD: So I’ve been in practice for 44 years. So it’s a long story. And I’ve been in this realm of periodontics which is actually the specialty of dentistry that treats gum disease and all the surrounding structures of the gum and the bone and even the jaw joint. And so very conventionally trained. I did traditional surgery. I believed that dental plaque was the worst thing that you could have in your mouth. I was under the impression that if you brushed and flossed you would have no gum disease or tooth decay. And if you did have it, you were just not a good flosser or brusher. And we would treat your gum disease with traditional, invasive surgery. All of these things that I’ve just told you are totally false. So how I started down this more holistic road is really my own personal story. So I’m 71 years old. So at the age of 59 I had a stroke. I thought I was a healthy, great guy. I had a stroke. I was exercising. I was eating foods that obviously were not healthy. But I thought it was healthy. The American Heart Association told me it was healthy. Unfortunately, I went to the organizations that I thought would give me information, like the American Heart Association, American Cancer Society, the American Diabetic Association. These organizations should be helping me understand a healthy diet and a healthy lifestyle. So from the age of 59 to 66, I continued to be on seven medicines. I weighed 187 pounds. And I was eating their diets. But it wasn’t changing my life. At the age of 66, I took a course called “A Nutrition Intensive for Healthcare Professionals,” a five-day course at the Kripalu Center for Yoga and Health, of all places. And it was the turning point in my life. And it introduced me to ancestral (or primal or paleo) concepts of nutrition and lifestyle. So at the end of five days, I went. I called my wife. And I told her when I’m coming home we’re going to make a few changes. And so she and I bumped heads for awhile. She said, “I’ll give you 30 days.” And we cleared out the pantry. And you know the paleo story. We changed all my eating habits, my lifestyle habits. And from the age of 66 until 71, this is what I do for myself. So I’m not on any medicines today. And I am healthier today than I’ve ever been in my life. And I weigh 153-154 pounds instead of 187. Never went on a diet. But as you know, you eat the healthy foods; the hormones change. The microbiome changes. And voilà! You get healthier. But I’m a committed guy, a little type A personality maybe. So that’s the story. DrAD: Integrative—yeah, medicine. And I also wrote a book. And I started to incorporate all of these concepts in the way I treat patients. And low and behold! When you start talking nutrition and health and get away from the idea that dental plaque is the worst thing in the world and that brushing and flossing is everything, then all of a sudden, not only mouths get healthier, but people get healthier. So this is what I did. And this is how I incorporated the treatment that I give to my patients today. I use a laser procedure, a very unique laser procedure called Laser-Assisted New Attachment Procedure which uses a laser with a specific wavelength that can kill very specific bacteria and also stimulates bone cells to regenerate from the jaw bone. Absolutely amazing! It’s like a magic wand. DrMR: Okay, so it’s something different. DrAD: No, and let’s talk about receding gums when you want to in a moment because that’s a really complex story. And it’s not a one etiology type of event. And it’s very difficult to restore gum tissue after it has receded. You can get a cosmetic result but not necessarily a better functional result. But we can talk about that. DrMR: Okay, alright. So a lot here I want to tackle. Let’s start with the connection between the gut and the mouth. And there are a couple of lead-in points I just want to lay out for us. You sent me a protocol that you’ve written up for a double blind, randomized control trial using probiotics and vitamin K2 in the prevention and I guess treatment of periodontal disease. I want to give you a chance to expand on that. But I just want to piggyback onto that. There have been two systematic reviews published that have shown that probiotics can be an effective treatment for periodontal disease. In short, both of these found that oral administration, so swallowing, as I understand it—these studies used these probiotics orally. So swallowing them, not a mouthwash—that was able to have a positive impact on periodontal disease which is a clear example of the importance of the gut in oral health. But I’ll lay that groundwork out, and then take us from there. DrAD: Okay, so assuming that those studies are accurate, which I believe they are, they’re telling you and they’re describing—and I don’t know the bacteria that were used for the probiotics. But they’re basically talking about living bacteria that are in capsules that you swallow. Now, in those capsules, these bacteria are doing a whole lot of things. And they’re creating a variety of metabolites. And in and of themselves, they have certain constituents that are extremely beneficial to the gut. So when you swallow these capsules of probiotics, just like sauerkraut, for example, and other fermented vegetables, there are living bacteria. But here is what happens. When these bacteria get into the stomach, the majority of the bacteria are killed. Then they get into the small intestine in the upper part of the duodenum. And the bile acids and salts destroy the rest. So there are not any living bacteria really in these products that get into small intestine or large intestine. However, the metabolites and all of the byproducts of these dead bacteria are extremely beneficial. And that’s where the studies show that there is benefit. However, there is some other interesting research. And it was published in 2017. The University of Texas Medical School, I believe, was where the tests were done. And they used five Bacillus, spore-based probiotics. Now, spores are unique. They’re not the same as soil-based probiotics because soil-based bacteria literally are alive in the soil. But spores are not really alive. They’re dormant in the soil, maybe for hundreds of thousands of years and whatever. And they get on the fruits and vegetables. And we eat these when it’s organic. And what happens with the spores that has been shown in other studies is that the spores are resistant to the acid in the stomach. They’re resistant to the bile. And when it gets into the small intestine and the large intestine, they start to replicate. So you’re getting new bacteria that actually grow which is really part of the definition of a real probiotic. In addition, the spores are stimulating other beneficial activity, so with small chain fatty acids and a host of other things, with the mucous membrane. And they’re contributing to a significant degree of health and balance in the microbiome of the gut, small and large intestine. So the study in Texas was, I thought, very fascinating. They took 48 people. And all of these people were screened so that they ate a McDonald’s hamburger or something like that. And they took a blood test before their hamburger and another four or five hours afterwards. And all of these 48 people scored a very high endotoxemia from the blood test, meaning they had gut dysbiosis. It leaked through the membrane of the gut. And it created an inflammatory state called endotoxemia. And they could identify it with a blood test. So these 48 people had a high level of endotoxemia after a bad meal. So they did a double blind study. They took 24. They gave them two capsule of a cellulose placebo and two capsules of this five Bacillus, spore-based probiotic. They took two capsules every day with a meal. And they took it for 30 days. They did not change any foods that they were eating. They didn’t change any habits or lifestyle. At the end of 30 days, they challenged all 48 with another hamburger, took a blood test before and a blood test four or five hours later. The placebo group had an increase in endotoxemia of 32% from baseline. And the experimental group who were on the probiotics had a 42% decrease in endotoxemia, even though they were eating a crappy meal, even though they didn’t change their lifestyle, and even only after 30 days. And it has been shown that it could take four to six months to really repair the gut lining. 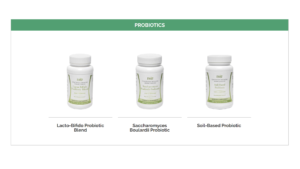 So the authors suggested that if they actually were on a healthier diet and if they were extending the period of taking these probiotics, they may have even healed their leaky gut completely. What an amazing story, I thought! DrMR: Let me jump in there for a minute, Al, because I do think some of these particulars here are important. And I think we’re painting an overly favorable picture for the impact of soil-base probiotics. I think that they are definitely important. And they are one of the three categories of probiotics that I recommend. But I think being cautious and conservative with our language is important. Just because we show a favorable change in endotoxemia, I don’t run too far with that. I like to stay anchored to what the outcome data shows us. And the study I believe you’re referring to is with MegaSporeBiotic. There have been about 14 other clinical trials, thankfully, with different types of spore-forming or soil-based Bacillus strains that have shown impressive clinical outcome. I don’t know of one with Bacillus strains that has shown a favorable impact on periodontal disease. But the two studies I was referencing earlier were mainly Lactobacillus and Bifidobacterium, so your lactic-acid-forming bacteria. So I don’t think, if we’re citing the data objectively, we can fully paint this picture that the soil based perform any better than the non soil based. But I’d like to give you a chance to respond to that but then also try to steer us back to how you think this ties to the mouth. And maybe you were going there. But, please. DrAD: Sure, yeah. And that’s where I was going. So what I’m thinking is all of the probiotics benefit the gut. DrAD: But the spores will tend not to be destroyed by the acids. So you get an additional benefit. So that’s what I’m thinking in the spore-based type of probiotic. DrMR: Sure. But, Al, and again this is more so just as a thought experiment in the way that we analyze this data because I’ve been misled by looking at a mechanism and drawing the inference that if we see, for example, the Bacillus strains somewhat resistant to degradation by acid, they would end up being better. DrAD: And I totally agree. But this is just the way I was creating my protocol. DrAD: So I’m seeing this as a potentially beneficial means to improve the gut microbiome and improve the intestinal membrane because we’re talking about gum disease which is simply a manifestation of chronic inflammation. So gum disease is along the continuum of the damage that is occurring in the gut. So if you create a dysbiotic situation or there is a dysbiotic situation that’s creating chronic inflammation, that chronic inflammation can affect many, many organ systems throughout the body, as you know. And most of these are going to be related to the genetic predisposition for that individual. So if the person is more predisposed to multiple sclerosis, they may get MS; or rheumatoid arthritis, they may get rheumatoid arthritis with this chronic inflammatory state. Or they may get psoriasis. Or they may get cardiovascular disease. Or they may get periodontal disease. So it’s all a matter of reducing the host resistance. And once the host resistance is occurring, for example in the mouth which is where my specialty is—once the host resistance is decreased, then the normal bacteria in the mouth have the potential to become dysbiotic. And there are maybe 700 different varieties of bacteria and dental plaque. And if you were to look at an individual bacterium, you may say this is potentially very pathogenic. But it’s only potentially. When these bacteria are in a state like healthy dental plaque, they’re in a state of balance. DrMR: Yeah, context matters a lot. DrAD: Absolutely. So if you look at our primal ancestors maybe 10,000 to 20,000 years ago, when you look at the skeletal remains, we can look at jaw remains. And we can see hard dental calcified plaque which is tartar. And that tartar can be identified from DNA testing. And we can show that there are hundreds of bacteria that are in a state of balance. We know that because these teeth rarely have tooth decay. And the jaw bone is rarely damaged. Yet, they had many, many areas of heavy dental plaque that calcified into tartar. So just because you have plaque in the mouth, the bacteria film, this biofilm, is actually a healthy biofilm in the body until it’s not. And when it’s not, it becomes unhealthy when the host resistance is lowered, and the foods that we’re eating start to feed the potentially pathogenic bacteria to become overgrown and become actually pathogenic. So host resistance is critical. And what I am thinking is what can we do to improve the host resistance? And this is part of what I was thinking about in the study. There’s another part of the study. And that has to do with vitamin K2. And there is an interesting study that was done on an animal model back in 2012, I think, where they used fruit flies. And they actually damaged the mitochondria of the fruit flies in such a way that it resembled Parkinson’s disease. And the flies couldn’t fly. And then in whatever manner, they created an environment where vitamin K2 could permeate these damaged mitochondria. And the mitochondria were rescued. And the fruit flies could fly. So there’s some research that suggests vitamin K2 not only is important for calcium metabolism but maybe reenergizing the mitochondria. DrMR: After fairly high doses of vitamin K2. DrMR: And they theorize it’s because it’s part of the electron transport chain which is part of the mechanism through which the mitochondria makes energy. DrAD: Correct. So this is what I’m thinking. Now, there was a study that was published a year or two ago that was an interesting study with gum tissue. The study actually took gum tissue from around the tooth surgically. There is a procedure called a crown lengthening where a person needs a crown on a tooth, and there’s too much gum tissue in the way. And the gum tissue is trimmed back. And this gum tissue is healthy. So this gum tissue that was taken from patients who needed a crown lengthening but did not have active gum disease, those tissues were taken and put into some kind of a solution. And what the investigators did was to include in this medium a strain of LPS from P. gingivalis which is a very virulent strain of bacterium that causes active periodontitis. So the LPS actually stimulated the gingival fibroblasts in these healthy tissue cells to create a reactive oxygen species that then in turn created an overabundance of cytokines that would have stimulated periodontal disease, periodontal breakdown. DrMR: So can you recapitulate that for people who are newer to this topic. Can you restate that in a very layman’s term just so we don’t lose anybody? DrAD: Sure. So there are gum tissue cells called gingival fibroblasts. These are cells in the gum tissues themselves. And when a person starts to have gum disease, generally one of the main bacterium that gets overproduced is a bacterium called P. gingivalis. P. gingivalis is a gram negative bacteria. Gram negative bacteria have an outer coating that is loaded with what’s called lipopolysaccharides (LPS). LPS is extremely inflammatory and creates an immune response. So this LPS, this bacteria in the gum tissue, starts to activate the gum tissues to create more chemical release to stimulate more breakdown in the gum tissues and the bone structure around the teeth. In other words, these gingival fibroblasts are activated because of the bacteria to break down the gum and bone around the teeth. When the researchers looked at the fibroblasts, they identified that the mitochondria in the fibroblasts were creating an abundance of free radicals, reactive oxygen species, creating these cytokines, these chemicals, that broke down the gum tissue and the bone structures. So what they did was they used an intervention of a way to reduce the reactive oxygen species, an antioxidant so to speak. And the antioxidant actually would reduce, because it was reducing the reactive oxygen species—reduced the chemicals that the gingival fibroblasts were producing. And because of that, they would not produce the damage from periodontal disease. And then they realized that if the gingival tissues were still exposed to this very unhealthy bacteria but the mitochondria were healthier and would not produce the excess reactive oxygen species, the excess cytokines, or the chemicals that were produced by the gingival fibroblasts, were not produced in that abundance. And they would not produce periodontal disease. In other words, periodontal disease is a disease of mitochondrial dysfunction. And if the mitochondria could be repaired, maybe the electron transport system improved and reduce the overproduction of reactive oxygen species, maybe gum disease could either be cured or reduced in severity. DrMR: So instead of going after the bacteria, the P. gingivalis, you’re going after the inflammatory state and the health of the mitochondria. And how I would interpret that is, if we get the inflammatory state down and the mitochondria healthier, then that P. gingivalis wouldn’t be able to have the same negative, pathogenic effect. DrAD: Correct. So if we go back to a healthy mouth, there are P. gingivalis bacteria and another 500 or 600 or 700 other bacteria. DrMR: Is this P. gingivalis a normal resident? DrAD: It is a normal resident in its smaller percentage ratio to others, yes. And P. gingivalis is found in healthy bacteria, although some people would say, “If there’s P. gingivalis, you have to kill it.” It’s just like other bacteria, just because you can identify it, you just don’t want to kill the bacteria because it changes the homeostasis in the environment. So what I am saying is, in a healthy environment, the host resistance is not decreased. The mitochondria are healthy. And the body allows the tissues to stay healthy because they are not influenced by dysbiosis. DrMR: So question. So it sounds like you’re now taking steps in the study that you’ve put together to test this hypothesis, which I think is absolutely fantastic. And I applaud you for doing that because really once we can answer that question in an outcome setting, we’ve got some very actionable data. Is there any other data? For example, have studies been done—well, we know some studies have been done using probiotics. And potentially probiotics in a roundabout way feed this same mechanism that you’re discussed. But to the other part of the mechanism, the vitamin K2, have there been any clinical trials? I know Weston A. Price has made a lot of suggestion and observation at diets high in K2 being correlated to healthier oral cavities. But do you know of any clinical trials looking at vitamin K2 and showing a favorable impact in the mouth? DrAD: I remember reading one that was not favorable. The problem was I think the study only lasted one or two weeks. Didn’t show a result. And you know sometimes these results can only occur after a continued use for an extended period of time. And I don’t know what the dosage of the vitamin K2 or even the form of the vitamin K2 was. So I don’t believe that there is any real clinical evidence that I can put my hands on that I have found. DrMR: Yeah, hopefully, you’ll change that. Have you started your study yet? DrAD: So the study is actually—the protocol is completely finished. It is being submitted to the Institutional Review Board on this Tuesday. And depending on how quickly they turn it around. And of course, the Institutional Review Board is only looking to the fact that I’m not going to harm any human beings. DrMR: Yeah, so for the audience, the Institutional Review Board (or the IRB) as Al just mentioned is just making sure that a study wouldn’t put anyone in harm’s way essentially. DrMR: We couldn’t say, “Does this toxin cause birth defects? Well, let’s expose a group of mothers to this toxin to assess.” That would be very unethical and would never be approved. DrAD: Right. And the IRB would never approve it. So you could never do a study like that. Exactly. And since the products that I’m going to be using have been in the marketplace for ten years, it’s not like these products have to be tested for toxicity at this point because they’ve already been tested. And they’ve been approved in whatever approval was necessary to get them in the marketplace. DrAD: So what I am thinking is—periodontal disease is divided into two basic diseases. There is gingivitis which is just inflammation, infection of the gum tissues that has not penetrated the jawbone and damaged the bone at all. And it could be reversible. And then there is periodontitis where the actual bone of the jaw, the alveolar bone, the bone that houses the tooth root in the jaw, becomes damaged and actually melts away. The question is, why does gingivitis progress to periodontitis in some patients, and other patients could have gingivitis forever and never develop periodontitis? My thinking is—and this has never been proven. My thinking is it’s because of the mitochondria. It’s because of the host resistance. If the mitochondria create inflammation but not excessive inflammation and not excessive production of these chemicals that produce damage to the bone, then you only have gingivitis. You only have gum infection. And it doesn’t go into the bone. It doesn’t become periodontitis. Once that turns and the infection becomes more virulent, you get this breakdown. And I’m thinking that it’s a matter of the mitochondria becoming more out of whack and more reactive oxygen species, more cytokine production, and more destruction, not necessarily more bacteria, although the bacteria P. gingivalis has a unique biofilm in and of itself. And it’s very difficult to destroy. So one of the things that happens is the cytokine that should kill the P. gingivalis isn’t doing that. And it’s a vicious cycle. And it gets worse and worse. DrMR: Hey, guys. We’ve discussed at length the benefits of probiotics. But it can be hard to know which specific probiotic products to use. One probiotic that I endorse is Just Thrive Probiotic. Just Thrive is one of the few category three (aka soil-based) probiotics I recommend. In fact, one exciting study has found that the strains in Just Thrive Probiotic can begin healing leaky gut. They also have some very exciting research coming in the future. Okay, so I want to get deeper into the treatment options in a moment because I’m very excited to get to the specifics here. But I just want to make sure that I’m tracking with you correctly and if I can try to reiterate this in a really simple way, even if it’s not perfect, just to help keep people with us. DrMR: Okay. Just wanted to make sure. DrAD: But it’s going to be all in one capsule. DrAD: So the capsule is going to include the five spore-based probiotics, which would be the MegaSporeBiotic, and the high dose of vitamin K2 which is MK7. And that’s going to be combined into the capsules. So here’s what we’re going to do. We’ve got six dental offices around the country so far that are ready to go once the IRB approves the protocol. They’re going to identify patients. And there are some exclusions, obviously. But these patients will have active gum disease, meaning that their gum tissues will bleed when they are pressed with a little instrument called a periodontal probe. And the spaces between the gum and the teeth have certain depths. And that would be anywhere from 4 to 6 mm, which is indicative of active gum disease. I’m not looking for serious, advanced gum disease. But I’m not only looking for just basic gingivitis. I want to have the infection that is actually getting under the gum and around the bone structure. So these patients will eventually be treated later on in maybe conventional ways. But what I want to do is have all these patients screened. Then there’ll be a double blind, randomized control selection. And patients will take either two capsules of a placebo, which is only cellulose. Or they will take two capsules of the combination of the vitamin K2 and the five Bacillus spores. DrAD: They’ll take them twice a day. They will not change any of their habits. They will not have been able to have an antibiotic treatment previous to selection, I think maybe four to six months. I can’t remember what we said. DrMR: Sure. Sounds about right, yep. DrAD: And they cannot use any mouthwash or oil pulling during the time. They cannot have their teeth cleaned. They can’t have dental fillings that go under the gum tissue because that’s an additional irritant which we don’t want to complicate with that. So we’re going to select these patients. They’re going to continue to do the capsules for six weeks. They’re changing nothing other than making sure they take these capsules every day, once a day with food for six weeks. At the end of six weeks, we’re going to check the gum tissues, the probing depth. And we’re only selecting four teeth. And we’re going to examine the same four teeth at the end of six weeks. We’ll measure the probing depth. We’ll measure any bleeding in the area. Now, there’s a unique test that we’re using to test mitochondria. That’s the important clincher here. To test mitochondria, the gold standard is generally a muscle biopsy which is very painful and difficult to do to get an evaluation of how healthy the mitochondria are. So there has been a noninvasive test that was reported in 2011 or 2012 by a medical researcher that took a buccal swab. They took a cotton swab like a Q-tip in the cheek area, the soft tissue of the cheek. And they did a variety of testing on that. And they could actually identify the health of complex one, two, three, and four of the electronic transfer chain. So in the mitochondria to get ATP produced, there is a relationship of electrons moving from one chemical reaction to another chemical reaction called complex one, complex two, complex three, complex four. And each one can have its own deficiencies. So this mucosal test of the cheek can identify the health of each of the four complexes as well as the quantity of mitochondria per cell in the cheek. And that relates to the mitochondria in the body in some kind of a relationship of about 82 or 84% accuracy. DrMR: And is this a test that’s routinely available? If a clinician listening to this wanted to do it in practice, could they do it? DrAD: Yeah, so actually it became commercially available six or seven months ago. And it’s called MitoSwab (M-I-T-O-S-W-A-B). So if you went to MitoSwab.com, Dr. Shree Ganeshan is—I’m not sure if he’s the owner or CEO. But he’s in charge of the lab and that particular testing. And you can order it as a practitioner from MitoSwab. It’s a very simple test. And the turnaround, I think, is about a week to 10 days for you to get the results. DrMR: And it’s been shown to have a high correlation. Do you know what the gold standard for mitochondria testing is? And then have they compared it to that? DrAD: Yes, so it’s muscle biopsy testing. So they have to take a biopsy of muscle. I’m not sure which muscle tissue they take. But from what I read, it is a pretty invasive and painful procedure. DrAD: 82 or 84% correlation to what a muscle biopsy would do, according to MitoSwab and according to the research that MitoSwab is based on that was published in 2012. I can get you that paper—I don’t have it offhand right now—if you want. DrMR: Yeah, if you want to send that over, I’m sure people will want to see that in the notes. DrAD: I will definitely. Definitely, I’ll do that. So what’s exciting here is—and I don’t know if I’m going to get the result that I want. But what is exciting here is when we test the gum tissues with the periodontal probe and the bleeding, we’re also going to take this swab of the cheek, freeze it, send it by overnight FedEx to the lab of MitoSwab. And they will test it for the basis of the mitochondria. I’m not really interested in where the mitochondria is at that point. What I’m interested in is six weeks later when we do the second MitoSwab. Has there been improvement in the mitochondria? DrAD: So if I can show this, then I actually believe this is much more far reaching than just gum disease because if mitochondria are damaged, they’re damaged throughout the body, maybe in different degrees. But they’re being damaged throughout the body. One study showed that inflammatory bowel disease, when it’s in remission, creates less gum disease. And when it’s active, it creates a significant increase in gum disease. DrMR: And the lungs and the urogenital. And that’s why I think we’re starting to see a lot of cross hop between these different barrier systems. Absolutely. DrAD: Correct. Correct. And so I think that if we can identify if we can improve the mitochondria in some easy way, then—I’m not saying we’re curing anything. But we can increase the resistance of the body and the health of the overall body, maybe improve outcomes with conventional medicine. Certainly, the two can relate together very, very nicely. DrMR: Because I’m excited to see what you find. I did want to try to tie in receding gum because I’m sure there are plenty of people here, myself included, who are dealing with a touch of receding gum and wondering what that means and what we can do about it. DrAD: I will probably contradict some of your other guests. DrAD: So I’ve been doing this for 44 years. I’ve seen receding gums all along. And I have some thoughts, some research. There’s not a whole lot of research. But there’s a lot of anecdotal understanding of what’s going on. So the gum tissue is like window dressing around the tooth. The gum tissue from a structural support system offers no support to the tooth. If you had no gum tissue, of course it would be painful. There would be exposed bone. But it doesn’t change the support of the tooth. The only thing that supports the tooth is the bone housing. If the bone breaks down, the tooth gets weaker. If you have gum infection and there’s no damage in the bone and other etiology that I’m going to explain in a moment is not there, the tooth is not in danger of being lost until the bone breaks down. So if you think about the gum tissue around the teeth when you’re talking about receding gums, you’re looking at the gum tissues that are on the cheek side of the teeth. You’re not looking at the gum tissue on the roof of the mouth or on the side of the tongue. So the gum tissue on the cheek side of the teeth is literally attached to a very, very thin layer of bone that is attached to the root of the tooth generally. If you brush really hard and the bone is intact under the gum, you cannot cause gum recession. However, if you were born with this very thin bone not there, which a lot of people don’t have this very thin bone or a degree of that bone is not there, then the gum tissue is just tight around the root of the tooth. It’s kind of attached to the root but not like it would be if it were attached to bone. And the gum tissue is slightly more susceptible to receding. And that gum tissue could recede. If you were to brush hard at the gum line and there’s no bone under the gum, the gum could shrink away. Now, if the gum shrinks away or recedes but it seals lower on the bottom teeth or higher on the upper teeth and there’s no active infection and it seals itself where the bone actually is and the root surfaces are not tender, you don’t have to do anything. It may not look as pretty as you want it. And there are cosmetic ways to correct that sometimes. But when the gum recedes and it is healthy and it is sealed where it recedes to and the roots are not sensitive, you don’t have to do anything. Here are other ways that the bone can break down. If you had an orthodontist do treatment in your mouth and they moved the teeth too quickly, the bone on the surface of the root facing the cheek could break down because as the tooth moves, the bone could break down. And it doesn’t grow back. Once that happens, the gum doesn’t recede right away. But it is more susceptible, again, if you were brushing hard. If you have active gum disease and there is inflammation under the gum and now it becomes periodontitis or it breaks down bone structure, the infection in the gum can melt away the bone that’s very thin. And the gum can recede right then. If you grind your teeth—now, airway obstruction can create some grinding habits. But a lot of people grind their teeth for a variety of other reasons. They grind their teeth because they’re under stress. For example, students that are college students during exams—and studies have been done to show that when they’re under stress they get a lot of jaw pain. Their muscles get very sore. And all of that is related to their gritting and grinding of the teeth. So if you grit and grind you teeth, you wiggle the teeth laterally from side to side, not up and down like you chew. You’re literally rocking the tooth from side to side. Like if you had a pole sitting in the ground and you wiggled the pole, it gets loose because the dirt is being pushed aside. If you grind your teeth, the bone starts to break down. Well, this very thin bone on the front of the teeth, the cheek side of the teeth, can break down from grinding the teeth. And then you can get recession. So there are a lot of various ways to get recession. And there are other ways to treat it. Laser doesn’t treat recession actually. DrMR: And you’re referring to the laser that is—and please fill this in because I don’t know much about this. But last time I went to a dentist, they said, “We have a laser that can be used to treat bacteria deep in the gum that can lead to recession.” And I didn’t take any action because I don’t trust anyone until I check things myself. But I’m assuming that’s what you’re referring to? DrAD: Okay, so that laser indirectly could help the gum infection, absolutely, because laser is a phenomenal way to treat gum disease. Obviously, diet is necessary. But certainly active gum disease, it’s a great way. And that’s what I use. There are various lasers that do different things. And certain lasers will just kill bacteria and not really stimulate bone cells. But yes, you can kill the bacteria of gum disease and prevent gum recession because gum recession is a result of gum disease that breaks down the bone, and then the gum recedes. That’s a sequelae of the gum infection. DrAD: There are surgical procedures where you can actually lift the gum up to cover the root on the bottom teeth or lift the gum down to cover the roots of the teeth on the top. And these will actually help the gum to seal to the root to some extent. But they’re never going to seal like it would have sealed if there were bone there. It’s almost impossible, although possible, but almost impossible to grow new bone on the surface of the root once that bone is lost. DrMR: Gotcha. Okay. So let’s go over some of the treatment recommendations. And then if we have a couple minutes, perhaps we can briefly just touch on the gum-heart disease connection. But I’m assuming if someone undergoes the oral health treatment options you outline, they’ll likely have their bases somewhat covered there. DrMR: We’ve talked about probiotics. We’ve talked about vitamin K2. What about brushing and flossing? What are your thoughts on either of these? DrAD: Sure. So brushing and flossing are important to remove unhealthy bacteria. Brushing and flossing should not be done to remove every stitch of dental plaque in your mouth because that is not healthy. Actually, dental plaque serves three purposes. Dental plaque, because of the bacteria in the dental plaque, produces a degree of hydrogen peroxide that actually kills other pathogens that could invade the area. It also maintains a pH that is relatively neutral or just slightly acidic so that it doesn’t damage the root surface. And then the saliva which is completely flushed with minerals will actually allow the minerals of the saliva to deposit into the plaque. And then the plaque is like the gatekeeper and puts these minerals into the root surface to remineralize the tooth 24 hours a day, seven days a week. So the plaque is important. You remove the plaque, it’s like going outside with no clothes on. You’re totally exposed. The dental plaque has a purpose. Now, unhealthy plaque is not good. And most people will have unhealthy plaque. We live in a society where we’re eating a western/American diet typically, where we’re under stress which changes the mouth bacteria as well as the gut bacteria, where we’re not sleeping well. All these factors can influence the bacteria. So brushing is important. I recommend brushing gently at the gum margin at a 45o angle, brushing horizontally. Not scrubbing, just slightly brushing the cheek side and the tongue side of the teeth. Flossing is okay. Flossing will remove food debris like pieces of fruit, vegetables, and meat that get stuck between the teeth. And they’re very effective to do that. But the best things to clean at the gum margin between the teeth are little tiny brushes. And there is a company that makes a phenomenal brush. It’s called TePe. It’s spelled T-E-P-E. And the brush is called an EasyPick. It’s made of silicone. It’s very tiny. And you clean in between the teeth like you would think about a baby brush cleaning a baby bottle. So you’re scrubbing back and forth at the gum line where the gum meets the tooth. And it is the most efficient way to remove unhealthy bacteria. You’re not going to scrub all of this healthy dental plaque off. So don’t worry about that. The only way to remove all the dental plaque is to use chemicals that don’t allow the plaque to form on the root of the tooth. DrMR: Okay. Coming back to brushing just for a minute. Something like a Sonicare brush that has those sonic pulse waves that are supposed to break down plaque, would you say that’s a good thing? A bad thing? DrAD: Fantastic. I use a Sonicare myself. That’s a great brush. Now Sonicare makes two brushes, one that sits in a cradle that plugs into the wall. The motor of the Sonicare is very efficient. They also make brushes that use batteries that you put into the body of the machine. The battery-operated toothbrushes don’t have good torque. So I don’t recommend those at all. So the ones that sit in a cradle that plug into a wall are the best. The Sonicare is terrific. The Oral-B also is another terrific one. DrAD: Different technologies, but both of them work well. DrMR: Okay. And have you seen the Quip toothbrush? DrMR: And that was what I liked about the Quip brush. They have soft bristles. And it’s only a $25 unit and a $5 replacement, whereas the Sonicare, I think you’re $100 maybe. DrAD: Yeah, for sure. They’re expensive. DrMR: So that might be a good entry level one if people—okay. DrAD: Absolutely! Even the ones that have batteries are fine. Just remember that the batteries don’t create a good torque. So it may sound like it’s doing a lot of work. But if you put the bristles on your fingernail, you’ll feel lots of noise and vibration. But you’ll see that the bristles don’t move very much because the torque isn’t very good. DrMR: And that’s what I’ve heard with any of these electric toothbrushes. You have to do little micro brushes in additional to letting the brush vibrate or whatever. DrMR: And then with the [TePe] brush, how does one use that? Would you use it after you brush? Or how do you put that into your regimen? DrAD: The TePe, you mean? DrAD: So it doesn’t really matter if you brush first and then use the TePe between the teeth or use the TePe first and brush with electric brush or a manual brush. It doesn’t really matter. That’s fine. DrAD: And then the other thing is that you want to clean the top of your tongue. DrAD: You’re using this twice a day—first thing in the morning and last thing at night. DrMR: So right along with your normal brushing. DrAD: Absolutely. And it feels good. It really feels good. And it’s very effective. DrMR: And then with flossing, how often would you say? Once a day? DrAD: So I floss first thing in the morning, last thing at night. Also because if there’s anything caught between the contacts of the teeth, I want to get it out. But I can tell you that all my training when I was in dental school suggested that you take dental floss, wrap it around the tooth, and go all the way down under the gum, and go up and down like a towel around a pole. That would make sense except one thing. When you take the floss at the gum line, most people that are really trying to do it right get very aggressive. And they saw the floss. And they literally cut a groove into the gum which they don’t realize. And the groove heals as a permanent groove that can allow more bacteria to accumulate because it’s a ditched area. So I don’t like flossing under the gum. It’s very ineffective actually. The best thing is the TePe. The little silicone bristles do a phenomenal job. DrMR: Ah! So don’t use the floss to go all the way. And that’s what I had been doing. I go all the way as far up or down as I can go. And you’re saying just go in between the teeth and not really all the way through to the gum. DrAD: And that can cause a lot of recession, too. So when you floss aggressively like that, you’re tearing the gum. You’re creating inflammation. And if the gum is not supported by good bone, that gum will get weakened. And it will recede. DrMR: Ah! That’s really good to know. And I would assume most of our listeners are not aware of that either. That’s probably a pretty common mistake, flossing all the way down until you hit bottom, so to speak. DrAD: Right, yeah. Most people will take that floss and saw it under the gum. And if you do that—I used to do that. And I have proof in my own mouth. I created grooves. And I didn’t even realize I was doing that. So that’s something that you really don’t want to do. I will touch on a couple more things because a lot of people use a Waterpik. I do not agree with a Waterpik. And here’s the reason why. A Waterpik has a high amount of pressure. And most Waterpiks, from 0 to 10, most aggressive people are going to use it at 7, 8, 9, or 10. And if you put that shooting water on your finger, it’s very sharp. So when you clean around the teeth, obviously, we will disturb and flush out a lot of stuff. And that’s what it’s supposed to do. But for example, if you had a deck on your backyard and there were lots of leaves because it’s fall and you took a leaf blower, you could blow those leaves off the deck one, two, three. But if you had a corner to your deck and then the corner had a wall on either side of this corner and if you angled the leaf blower into that 90o angle, those leaves would impact into that 90o angle corner. They wouldn’t disperse. So if you use a Waterpik at a medium to high pressure speed and you get under the gum and you don’t necessarily really know the angle you’re using, the gum space between the gum and the tooth narrows as it gets deeper. So you can literally shoot microscopic particles of broken down food particles and bacteria more deeply under the gum and impacted more deeply than it ever was on its own. DrAD: That’s one thing. The other thing is, if everything was working with the Waterpik and you didn’t impact anything under the gum but you were using it and you had gum disease and you wanted to get healthier and you used it every day (most people would use it a couple times a day). If the gum tissue was trying to heal and you’re using this Waterpik, it’s going to destroy the epithelial cells that are trying to heal. So you’re going to create a crevice, just like if you had a scab on your arm and you picked it every day. You didn’t allow the scab to form long enough for the skin the mature underneath. It probably would heal. But you’d have a really ugly scar left. So I don’t like a Waterpik. The other thing I do want to mention is there’s a lot of bacteria in the mouth on the top of the tongue. And when it’s overgrown, 90% of mouth odor, if it’s not coming from other parts of the body, like the lungs and the gut and whatever—in the mouth, it’s going to come from the top of the tongue. So the way to remove that overgrown bacteria is to take a teaspoon. Invert it. Go back on top of your tongue all the way to the throat, to the area where you’re just about ready to gag. Take that spoon and pull it forward, scrubbing the tongue. And you’ll see a milky fluid. And you’ll just do that two or three times, maybe twice a day. And you’ll remove the excess bacteria. If you want to know what that would smell like on your breath, take that milky material on the teaspoon. And maybe put it on your arm and let it dry. And after it dries, take a sniff of it. And that’s what your breath smells like. DrMR: Okay. That’s a little self experiment people can run. DrAD: It’s a way to motivate you to clean your tongue. DrMR: Sure. Sure. One or two questions as we move to a close. And if there’s anything else you want to add in between here, please. But I did want to make sure to ask you about hydrogen peroxide as a mouthwash. I recently read a paper, a very pointed criticism that this could be carcinogenic due to the noxious nature of using hydrogen peroxide in an unregulated, uncontrolled way as a mouthwash. Do you have any thoughts on that? DrAD: Absolutely. And I have the same thoughts of any mouthwash. Hydrogen peroxide is just one. Hydrogen peroxide is good for a week to 10 days if you have the active disease and you want to calm things down. There is an over-the-counter brand called Peroxyl made by Colgate, not a prescription. Very effective. You use it for a week to 10 days, and that’s it. But if you use peroxide too long, it’s good for bacteria. It doesn’t kill yeast. So you can get an overgrowth of yeast in the mouth. That’s one reason not to use it. But there’s another really good reason not to use that. And no antimicrobial mouthwashes. No Listerine. No chlorhexidine. No gadgets that say, “This is going to kill the bacteria in your mouth.” And here’s the reason why. The tongue bacteria that I just told you that you want to remove in excess, those are made up of anaerobic bacteria. The tongue bacteria actually provide a biological function that is critical medically. For example, when you eat foods like leafy greens and you’re eating these foods, there’s a lot of natural nitrate in these foods. Your body—you chew it. And most of the nitrates start to absorb in the upper part of the small intestine. And 25% of the nitrate that’s absorbed into the bloodstream actually gets absorbed into the salivary glands. The saliva is replete with active, biologically active nitrate. The tongue bacteria, the anaerobic bacteria on the tongue, breaks down the nitrate to nitrite. You swallow the nitrite, not knowing you just swallowed your saliva. And the nitrite goes through a variety of methods that create, eventually, a lot of nitric oxide. And nitric oxide is important for gum health as well as cardiovascular health, blood pressure control and whatever. There was a paper that was published by a few cardiologists just six months ago, I think. And it stated that if you’re a cardiologist and you are prescribing blood pressure medication to your patients and you’re not getting the control that you think you need to get, make sure your patients are not using antimicrobial mouthwashes every day because they’re destroying the bacteria that creates, eventually, nitric oxide. And it can decrease nitric oxide by 25% in your body, increasing blood pressure. DrMR: Wow. Wow. Well, I think we may need to have you come back on to talk about the gum disease-heart connection because I’m sure people are curious to explore that a little more. DrAD: Yeah, and there’s a huge connection. But it really starts in the gut. And the mouth is just one example. I will tell you. When you have a leaky gut and you have a leaky periodontal pocket, it’s the same thing. If you treat the gut and you don’t treat the gum disease, you’re going to have problems. If you treat the gum disease and you don’t treat the leaky gut, you still have problems. Functional medicine and dentistry and conventional medicine have to come together to understand you have to treat the gut as well as the periodontal disease and other infectious mucosal diseases like a lung abscess or whatever. I think that’s incredibly well said. And I’m sure people are wondering, “Okay, this sounds all very compelling. Maybe the dentist I’m seeing isn’t totally up to snuff on this. Where can I find a good dentist?” Are there any associations or websites you would point people to, to do so? DrMR: Yeah, so you’ve got to do your own research also. DrAD: But there is the InternationalAcademyofBiologicalDentistryandMedicine.org. And then there is the InternationalAcademyofOralMedicineandToxicology.org. And those two websites have pages that patients can put their zip codes in. And you can find the people that are members in your zip code. And at least these people probably are more in tune to a biological approach. But a lot of biological dentists don’t really get ancestral nutrition and lifestyle. So they’re really not in tune with that. They’re more in tune with the biology, which is good. But they think that we need to kill all this bacteria, and then we won’t have disease. And I don’t believe that’s the case. We need to improve the immune system. And to improve the immune system is not to kill bacteria. Fortunately, many people are not using antibacterial soaps, for example, anymore because of that. We’re not using hair cleaning devices and going to take a shower to kill all this bacteria. We’re just going to wash away the excess bacteria. But we don’t want to sterilize our bodies. We don’t want to take an antibiotic, for example, a penicillin tablet every day just to make sure that we don’t get disease. People don’t want to kill—and they should not want to kill—the good bacteria in their bodies. DrMR: You’re preaching to the choir here, I think. DrAD: I know. But somebody may not have heard that. DrMR: Yeah. No, it always helps to have that reiteration of any important concept. Is there anything that you want to offer the audience in close? And would you also please tell people your website, your book, and anything else that you want to mention? DrAD: Sure. I do know that you’re never too old to make a change. So I changed my life at the age of 66. So don’t think that you’re too far gone; you can’t make a change. And you know that with your patients, too, Michael. I’m sure. DrAD: So that’s an important statement. I can be reached at my website, DrDanenberg.com. So it’s D-R-D-A-N-E-N-B-E-R-G.com. My book is Crazy Good Living. It’s on Amazon and all book sellers. So that’s a possibility. It’s basically looking at what I call the four pillars of health which are nutrient-dense foods, restorative sleep, efficient exercise, and stress reduction from the eyes of a periodontist, going all the way back to ancestral time. So I’m trying to put all of the little dots together and create a concept. I believe we can stop chronic disease today—and periodontal disease is just one form of chronic disease—by getting these four pillars under control. DrMR: Well, you’re doing a heck of a job, Al. I’m glad that you’re on board and you had your epiphany. Even if late in life, I think you’re closing the gap pretty quickly. DrMR: Well, thanks again. And please keep me abreast of your study. And we’ll definitely have you back to elaborate on that. DrAD: I will. Thanks a lot. Regarding the use of a tongue scraper to remove the anaerobic bacteria.. if that bacteria is good and necessary in order to breakdown nitrates into nitrites, why would scraping the tongue be healthy? Scraping the tongue only removes the “excess” anaerobic bacteria and food particles that are breaking down into odoriferous compounds.. The majority of the healthy anaerobic bacteria remains.